In the first book in a spin-off series to her best-selling and highly rated 'GROUPIE' trilogy, author Ginger Voight introduces us to a new character named Jordi Hemphill. All her life, Jordi Hemphill was told that she needed to change to fit in and be accepted. She talked too much, laughed too loud, and most definitely, indisputably and inexcusably weighed too much. In fact, she wore her size-20+ clothes without so much as an apology. She didn’t care to fit in. She didn’t want to be beautiful. Instead, she wanted to wear her hair in funky colors, she itched for tattoos and piercings, and dreamed of a life much bigger than working at the local Burger Palace for minimum wage. She had been born with the voice of a superstar, and something inside her told her it was OK to dream big, even if she had to do it in secret. On her eighteenth birthday, she takes every last cent she has and buys a one-way ticket for Los Angeles. She is sure her talent will get her noticed by those more open-minded to see it. Then and only then will she show all the naysayers in her hometown that she was a somebody no matter what they say. Unfortunately Los Angeles wasn't any more welcoming. Jordi didn't fit into their pop machine no matter how well she sang. Other pop princess had the "full package," whereas Jordi still needed to change if she wanted her dreams to come true. It took a plus-size TV producer to take a chance on her, casting her for a reality talent show called "Fierce," which put attitude and talent far above the traditional pop star image. Thanks to Giovanni Carnevale, the lead singer of "Dreaming in Blue" and “Fierce’s” rock star judge, Jordi gets a chance to fight for her place on a national stage. But will America embrace this alternative diva? Or will they too expect her to conform in order to be accepted... to be loved? Despite the acceptance of new friends and supporters, old ghosts continue to haunt Jordi on her new journey. It will take handsome fellow contestant, Jace Riga, to finally help expose and exorcise the demons that drive her self-destruction. 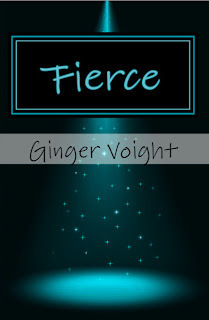 "Fierce" continues the story introduced in the Ginger Voight novel, "Mogul," where Jordi joins a hodge-podge of other contestants to battle for the championship that dares every single hopeful to live large, to be FIERCE. 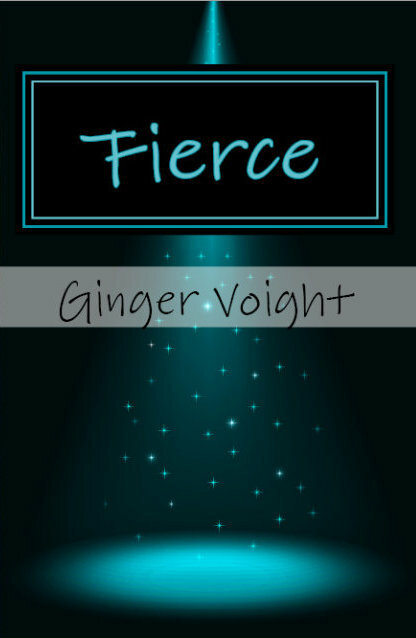 Ginger Voight, the author of the best-selling "Groupie" series, brings fame once again to the forefront with her new adult series, beginning with the novel, "Fierce." The characters you grew to love in the "Groupie" trilogy and "Love Plus One" are back to help the incomparable Jordi Hemphill carve a place for her as a pop princess despite the odds in this coming-of-age Rubenesque romance. My hands were shaking as I lifted the sheet music to the stand in front of me. I had finally decided on the song I wanted to sing, a Celine Dion tune that was sure to show off my range and give me something a little more current than an obscure tune from a musical. She stood in front of me, arms folded in front of her, glaring over the tops of her glasses as I sang the first couple of bars. Her countenance was as severe as her cropped silver hair, and her pursed lips and narrowed eyes gave nothing away in how she thought I was doing. My voice lost a bit of steam as I made it to the chorus, and actually cracked when I went for my upper register. She held up her hand with an exasperated sigh. I glanced down. It was another Celine song, but an upbeat number I had never performed before. “Why?” I asked. When I looked up at her, she had an arched eyebrow that indicated she did not like to be questioned about her choices. “But I don’t know this song,” I offered helplessly. “Then learn it,” she said. She folded her arms, leaned back against the edge of the table, and waited. I cleared my throat as I read through the music. When I opened my mouth, I had zero self-confidence I could pull it off. The more I struggled, the more awkward it got. Finally, with another exhale of exasperation, she stomped over to me. She took up the next verse with a powerful voice that demanded I look at her as she sang, but the minute my eyes came off the page she was pointing her finger back down to it. She wanted me to follow the notes as she demonstrated how it was supposed to be done. Even without a backup band, her voice boomed through the empty auditorium that had been constructed on the soundstage. When she finished, I could think of nothing to say. “This is an entertainment competition, not a high school pageant. You will not win by playing it safe. You need to take risks and step outside your comfort zone. You need to own what you can do on this stage. This song can do that for you. Or it can break you. Your choice.” She walked back over to the table and screamed out, “Next!” to dismiss me and invite the next victim into her little lair. I passed Shelby as I made my way down the steps. She gave me a sympathetic smile as she squeezed my arm. Rather than watch her time at the gallows, I escaped and made my way to the food truck outside. Pepper and Lavender sat together at one of the tables nearby, and beckoned me to join them. They already knew from the look on my face where I had been and what had happened. “Imogene strikes again,” Lavender smiled, her full lips painted a pale purple color indicative of her stage name. She wore fabulous wigs in varying shades of purple as well, and today she wore a grape-colored bob to match her 60s mod-style plastic dress. I still wasn’t convinced, so after I ate the two of them dragged me to an empty sound stage to show me how it was done. Like Imogene, their voices were big enough to carry the song. Together they filled the empty space with a huge wall of sound. Once they hit the chorus, I finally joined in. They spent the next hour teaching me the song until I no longer needed the sheet music. More than that, Lavender used her considerable performance skills to show me how to deliver the song. She tried to teach me some dance moves, but I felt like a clumsy idiot as I tried to imitate what she pulled off so flawlessly. She was patient as a saint, as was Pepper, as we fell into an impromptu group choreography I was glad no one else could see. At least, I thought no one else could see it. When we finished, we were rewarded to hear applause from one lone spectator hidden in the darkened shadows of the empty sound stage. “I haven’t decided yet,” I said as I gathered my stuff. “She’s feeling a little insecure,” Lavender told him quietly with a wink and a nudge of her elbow. She glanced over at Pepper, nodding toward the door so they could leave us alone. Apparently Jace had some convincing to do. “So what’s the problem with the song?” he wanted to know. “Hey,” he said firmly as he looked me in the eye. “Don’t talk about yourself like that.” The tone in his voice left no room for argument, so I said nothing. “Sing it for me,” he instructed softly. I cleared my throat and glanced down at the sheet music, having completely forgotten every single word of a song I had just sung over and over for the last hour and a half. I started to sing, following the notes on the page, and Jace indulged me for about a verse before he finally took the paper from my hands. “Sing it to me,” he corrected. He took a couple of steps back and gave me a stage. I looked into those deep, green eyes and took a deep breath before I launched into a song that talked about loving someone deeper than a river and higher than a mountain. I sang this to a virtual stranger, memorizing every line in his handsome face as I went through verse after voice of everlasting devotion. By the time I got to the chorus, my huge voice made it all the way to the rafters and back. I got stuck a little on the second verse, so he joined in. Butterflies tap-danced in my tummy as he sold the song very convincingly through his body language and the look in his eyes. When we hit the chorus, he linked his hand in mine with a smile that I couldn’t help but mirror. He pulled me through a couple of dance moves as we brought it home, our voices echoing in the empty space. He spun me around and I twirled around him, allowing myself to fall completely in character of the song. We were laughing as we finished and he pulled me into a hug. “You are so not a weak link, Jordi,” he said into my hair. He pulled back a little, but still held me in his embrace. His arms were linked around my waist, pressing me into his strong chest. Long moments passed between us as we did nothing more than look into each other’s eyes. I honestly didn’t know what to say. Nervously I bit my lip, which drew his gaze in that direction. I felt every single nerve ending go up in flames. What it took Eddie physical intimacy to achieve, Jace had managed with just an absently placed glance. I cleared my throat as I pulled away. “I guess I should head over to see Jorge,” I said. A flood of warmth washed over me as I looked into his hopeful eyes. I didn’t know what I saw there, or what I wanted to see there, but the way it made me feel was head and shoulders above the high I got from anything else, even food. Just being in his company made me feel better about me. I felt accepted… wanted… for the first time ever. Lunch was the least of my concerns as I nodded with a smile. 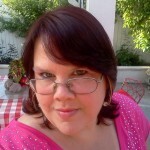 Ginger Voight is prolific author, freelance writer and optioned screenwriter. Her fiction is diverse, with novels like the edgy, coming-of-age drama DIRTY LITTLE SECRETS, and the fun family adventure for kids of all ages, COMIC SQUAD. Having grown up reading different authors like Danielle Steel and Stephen King, Ginger has always been drawn more to story than to genre. This shows up in her various stories. Titles such as MY IMMORTAL and TASTE OF BLOOD are a delicious, heady mix of horror, suspense, and romance. Genre romance, however, has held a special place in her heart, ever since she read her first Harlequin novel when she was only eleven. As a result, Ginger is making a name for herself writing romances of her own, starring women who look more like the average American woman rather than those traditionally represented in the size-biased American media. Her Rubenesque romances were created especially for those heroines with fuller figures, who can still get the man of their dreams if only they believe they can. Such titles include UNDER TEXAS SKIES, LOVE PLUS ONE, GROUPIE and PICTURE POSTCARDS. Ginger was included in the best-selling book by Smith Magazine NOT QUITE WHAT I WAS PLANNING, featuring her six-word memoir. My favorite author is a trick question. However, I LOVE Molly McAdam's books and think she is incredible!! I LOVED her book Taking Chances and it is unforgettable! !